Fifty girls sat cross legged on the black floor, surrounded by backpacks, bikes, and sheets of paper stamped with the words "Spread the love. Dominate the world." They had just finished a post-training stretching session at an evening Fast and Female camp in late October during the Shimano Canadian Cyclocross Championships in Winnipeg. The mostly pre-high school athletes practice sports from cycling and ringette. They listened carefully as a panel of the world's top female athletes answered their questions: How do you snap back from a bad day? When you first started your sport, were you really bad? Chances are, girls would hesitate to pose those questions with boys around. Young women who take sports seriously must forge a way through thickets of peer pressure, doubters, and cultural norms. "There's a conception that it's more acceptable for boys to stay in sport longer than girls," said Fast and Female's Executive Director in Canada, Marie-Hélène Thibeault. According to the Women's Sports Foundation, by age 14 girls drop out of sports twice as frequently as boys; other sources cite a rate of six times. Fast and Female aims to keep girls in sports and encourage a healthy lifestyle by creating connections between girls and elite sportswomen called ambassadors. Canadian Chandra Crawford, an Olympic gold medalist in cross-country skiing, founded the organization in 2005. Programs started in Canada and have extended to the US. Canadian Olympic ski jumper Taylor Henrich has attended a Fast and Female event. "Our mantras are 'Spread the love' and 'Dominate the world'," Crawford said, "which speak to both making the sport environment positive for girls and empowering them to unleash their full confidence and courage in anything they pursue in life." Thibeault elaborated. "Sometimes girls have a tendency to downplay their strengths. 'Dominate the world' is about dreaming big. It's thriving and being good at something and being proud of that." The sportswomen shepherding the youngsters in Winnipeg provided living, laughing, touchable proof that girls can find paths to personal fulfillment through sport and competition at high levels. Most of the ambassadors were Canadian. The professional cyclists among them included world mountain bike champion Catharine Pendrel, three-time national cycling champion Leah Kirchmann, 2012 national cyclocross champion Mical Dyck, and 21 year-old cyclocross and mountain biking sensation Maghalie Rochette. World-class non-Canadian cyclists supplied additional ambassador power: American Ellen Noble, a mountain bike and cyclocross national champion, and top British cyclocrosser Gabby Durrin. Fast and Female staff and ambassadors assemble partial or full day events. Ambassadors spend time with the girls in physical, educational, and inspirational activities. Some events offer concurrent sessions for parents. Kirchmann, a Winnipeg resident, had participated in events in other provinces. She wanted to bring the program to Manitobans and spearheaded the event held in Winnipeg at the Manitoba Theatre for Young People. In 2014 she was the only North American among the top three finishers in the prestigious women's road cycling race, La Course by Le Tour de France. As a young cross-country skier and cyclist, Kirchmann benefited from guidance provided by female mentors. "Sport has been such an important part of my life and really has shaped who I am and taught me so many lessons," Kirchmann said, "that I just want to share my love of sport with these young girls and make them realize it can be an amazing part of your life if you just stay with it." Based on work by Vickie Harber at the University of Alberta, Fast and Female camps focus on three activities designed to reduce the dropout rate among girls in sports: socialization, mentorship, and skill development. "If we do those well and if clubs and coaches incorporate them in their training, we're going to be able to overcome [the dropout rate]," said Thibeault. The organization offers a one hour format, Power Hour, which groups can run on their own time. When the ambassadors introduced themselves at the Winnipeg camp, they shared favorite sports memories. Representing Canada at international races. The instants when they knew sport meant everything to them. Winnipeg-based sportswomen also served as ambassadors: Lindsay Argue, a national medalist in cycling and currently a development cycling coach for Manitoba, road racer Genevieve Krahn, and Ellie Jack, a ringette player. Girls gathered in circles containing ambassadors who advised them as they jotted down big goals; competing in the Manitoba Games surfaced several times. Regarding nutrition needed to achieve her goal, one girl wrote, "Stay committed and don't cheat." Campers penciled in the titles of energizing songs and qualities that make them unique. Then everyone headed outside. Some pedaled away to pick up tips from Pendrel, Noble, and Durrin on the adjacent cyclocross championship course. The rest tackled a combination of core, strength, and agility activities. Kirchmann and other ambassadors elicited suggestions for drills from the girls. They tip-toed through campers lined up side-by-side in plank position, dipping into the space between each one. "It makes it feel like a team workout," Argue explained, "so they don't feel like they're suffering alone." As the sun set and nighttime chill stole over the grassy fields, everyone hopped like rabbits, leapt like gazelles, and crept like cheetahs stalking prey. Dyck and a girl who nursed an ankle injury dashed off a set of crunches. Meanwhile in the theatre, experts schooled parents in sports nutrition and psychology. Back inside and after stretching, ambassadors described tips that helped them in their sporting careers. Noble, 18, tried hockey, wrestling, and running before she settled on cycling. "When a person says you can't ride it or do something, remember you are capable," Noble said. "When I was five, I told someone, 'I think girls can do anything better than boys.'" The next time a male spectator would peer over the lip of a run-up on a cyclocross course and state, "Girls can't ride that," the Fast and Female campers would know how to respond. Thirteen year-old camper Miriam Huebner from Winnipeg said the ambassadors' stories were motivating. "It was awesome to meet people like Catharine Pendrel and Gabby Durrin. You could ask them questions, like how to manage your nerves. It was good not having boys there because they would have taken all the attention." Kirchmann looks to repeat the event next fall when the Shimano Canadian Cyclocross Championships returns to Winnipeg. Fast and Female is a not-for-profit society started in 2005 by Chandra Crawford, an Olympic gold medalist in cross country skiing at the 2006 Olympic Games. The organization's goal is to support, motivate, inspire and empower girls age nine to nineteen to stick to sports and a healthy lifestyle. 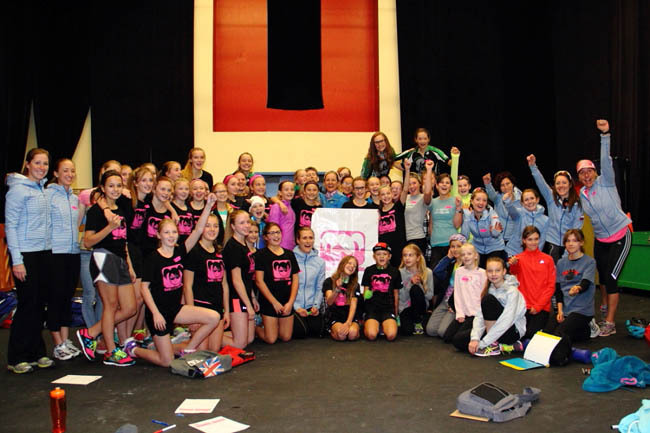 Fast and Female creates empowerment through sport for girls by hosting fun-filled, non-competitive programming led by female Olympians and elite athletes, as well as by delivering educational content to parents and coaches. Learn about the organization at www.fastandfemale.com. Story courtesy 2014 Cyclo-cross Championships organizers. Photo by Mary Topping.